September 1939. A beautiful Irish maid realizes that her scheming has led to a fatal mistake. A strong-willed nursing sister prepares to head for Europe, and war. September 2006. A biographer arrives at a grand, historic cottage on Muskoka’s Millionaires’ Row to assist the matriarch of the wealthy Madison family with the writing of her memoirs. Moira Madison was born to a luxurious childhood, raised between the wars as the pampered daughter of a wealthy family. But she was determined to make her own life for herself and served as a Nursing Sister in the Canadian Army during World War Two and international aid worker for many years after. Her story is a fascinating one, her personality even more so, and Elaine Benson is eager to dive into the research. But the original biographer died her first week on the job, and something is moving in the dark woods beyond reach of the sparkling lights of the great home. 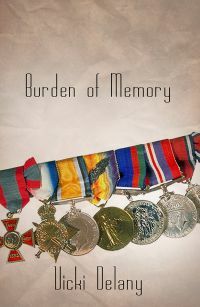 Burden of Memory shifts from the luxurious world of lakeside summer homes between the wars to the horrors of the Battle of Britain and the allied push through Italy, to a very modern woman caught up in the swirl of forces beyond her understanding.